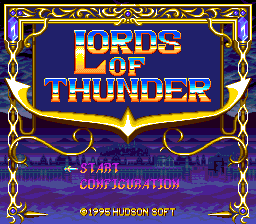 Lords of Thunder is a sidescrolling shoot-'em-up released for a number of platforms including the Sega Mega-CD. It is a sequel to Hudson Soft's earlier shooter, Gate of Thunder. The Mega-CD version was not released in Japan. Main article: Lords of Thunder/Magazine articles. NEC Retro has more information related to Lords of Thunder.